DETROIT RUNNER....: Yowza! Another 20! Today my running buddy and I completed our second 20 miler before our marathon on Memorial Day weekend. Done! And the splits were mighty fine in my opinion. My only question ---- can I keep up this pace for another 6.2 miles to beat my 4 hour goal? I have confidence that I can but I'm still right on the edge. The last three miles of today's run was brutal so I'm not sure how the last 6.2 will be(really bad I'm sure) but I'm ready to find out. Regardless, I'm going to make this a great first marathon and be happy that I'll have a PR either way. We met a couple people who were also doing their 20's today as well and will be running in the same marathon - Bayshore up in Traverse City. We also had one of my running buddy's friends join us. His plan was to do 12 with us. We got about 3 miles out and he fell on the trails. Wow. I was really worried for him. He said that he was Ok and then about another mile into it, he backed off and let us go ahead. I think he got the wind knocked out of him. Ouch. I have never fallen when running, thankfully, but sure hope he was Ok. I'll find out from my running buddy this week. I probably would have backed off as well if I were him because he really took a tumble. 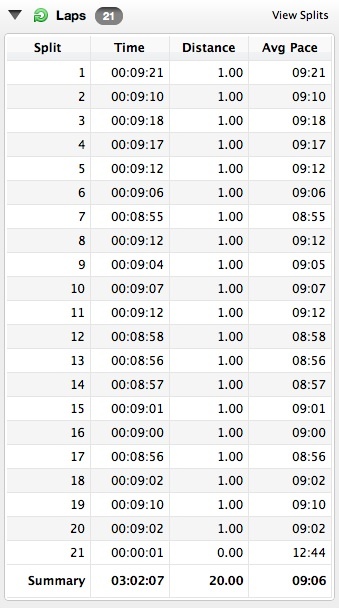 Here's our splits. As you can see, another 6.2 is cutting it really close with my pace to break 4 hours. I am proud of the consistency. I'm hoping the race is as close to 26.2 as we can get so I don't have to worry about missing it by seconds. 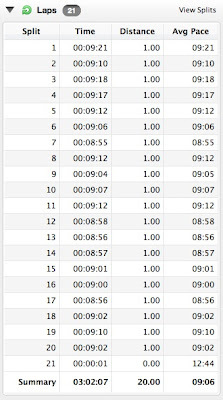 We did start a little too slow on mile 1 though so I can make up 10-15 seconds right there. Yikes, I'm worrying about seconds! It's been a busy day. Lunch out with the mother-in-law and time spent at my Mom's house. It's only 7pm and I'm ready for bed! Question of the day: For those that run marathons - do you do 1 or 2 20 miler runs. The second one did help build my confidence that I can do it! I've been struggling with injuries during my marathon training so I've never done more than one 20 miler and I've never done more than 20 miles. Congratulations on getting your second in - sounds like you are really prepared! Both times I ran a marathon, I did a 20 and a 22. The 22 was helpful for me because it showed me where my 'wall' was ;-) I think doing the two 20's is beneficial and you will be glad to draw from those run experiences. nice splits! I hope your friend is ok! I've never fallen running either, but it would probably really shake me up! I'm about ready for bed too and I only ran seven today, though I did also go for a hike! Awesome! Makes me excited for mine tomorrow. :) Hope your buddy's friend is OK.
Looks like you're going to be 100% ready to kill it at Bayshore! Thanks everyone. I'm looking forward to the taper actually. Rose - I'm just following the Hal Higdon Intermediate plan. I only ran 1-20 mile run, but I can see how 2 would help your confidence level! Great job on the run! I ran 1-20 miler when I ran my first marathon. I've run 2-20's for both Chicago and now Bayshore training. Great job on the run... remember, training runs are harder than races! :) I've only ever did one. I think the second for people is usually more about confidence than anything. glad your running partner's friend is alright. I've totally bit it running before. It hurts... both the body and the pride!